Dashghar Union Progoti Trust organised its Iftar Party and Duwa Mahfil on 29th of May in a restaurant in East London. 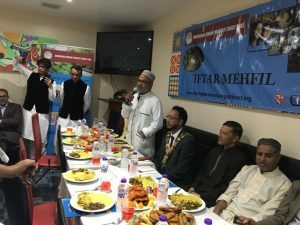 The UK living expats of Dashghar and a number of community leaders took part in the Iftar Mahfil. The organisation represents UK living ex-residents of Dashghar Union of Bishwanath Upozilla. The speakers at the event focused on the works of the organisation and urged everyone’s co-operation to help the organisation to achieve its goal. President of the organisation Saidul Islam Nanu presided ovrer the meeting and General Secretary Monir Ali conducted it. Speaker of Tower Hamlets Council Ayas Miah addressed the audience as Chief Guest. Other guests who took part in the Iftar and Duwa Mahfil included Trustee Judge Belayet Hossain, former Chairman Nesawar Ali, Foijur Rahman, Founding General Secretary Sirajul Islam, Treasurer of Bishwanath Education Trust Ajam Ali, Mahmud Ali, Vice-president Shahjahan Miah, Treasurer Mujibur Rahman Madhu Miah, Co-treasurer Selim Ahmed, EC Member Suban Ali Bari, Abdur Towahid, Anwar Chowdhury, Kamal Uddin Ahmed, Sarfaraj Khan Chapal, Shamsul Haque, Abdul Haque, Advisor Abdul Mukit, Gias Uddin, Mohammod Abdul Gafur, Mohammod Hossain, Nesar Ali, for General Secretary Akhlakur Rahman, foyjur Rahman, Sajid Ali Menon, Abdus Sahid Harun, Afsor Ali Choto, Trustee Abul Hasanat, Abdul Haque Habib, Siddique Ali, Hamdu Miah, Abdul Hamid, Koysor Ali, Nazrul Islam, Faruq Miah, Sirajul Islam Jaigirdar, Abdul Malik, Ashiqur Rahman, Abul Kashem Yaheeya, Ripon Miah, Emdadul Haque Shikdar and others.